← Max Allan Collins drops by to discuss his writing and ‘Seduction of the Innocent’. Published by Black Swan (Transworld) on 28th March. They said Pastor Chambliss was a good man. heal the sick – like my brother Stump. And it wasn’t no miracle. From the opening of this superb and beautifully told tale I wasn’t at all surprised that it had so deservedly been awarded the CWA John Creasey (New Blood) Dagger award for best first novel 2012. Wiley Cash has such a fresh and atmospheric tone to his writing that I couldn’t help but be completely and utterly drawn in. Told from three key viewpoints, this tale of a preacher of dubious means and the spell he seems to have his flock under in the town of Marshall in North Carolina is pure American Gothic, a place of secrets, of family bonds both broken and healing. It’s a gentle book but with a dark terror at its heart. The fact that the author was inspired by the true story of a young African American boy being smothered during a healing ceremony, coupled with his own upbringing in an evangelical church in the South, have clearly collided in a wonderful way to provide such an emotive and intense read. 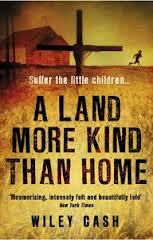 A Land More Kind Than Home is a fairly quick read, much aided by the fact that, like the lead character, nine year old Jess Hall, you’ll be so caught up in the story to find out what has happened to his brother, that those pages will turn faster and with more rewards than many of the more generic crime thrillers that adorn the bookstores. Here’s a real chance to try something new in crime fiction – a great debut. I remember reading this one last year… It stayed with me for a while.